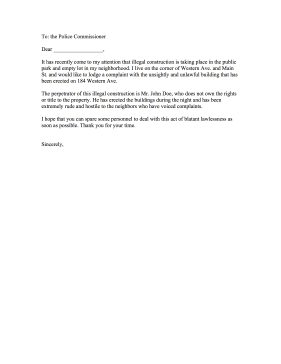 Legal recourse can be sidestepped by using this complaint letter against illegal construction. It has recently come to my attention that illegal construction is taking place in the public park and empty lot in my neighborhood. I live on the corner of Western Ave. and Main St. and would like to lodge a complaint with the unsightly and unlawful building that has been erected on 184 Western Ave. The perpetrator of this illegal construction is Mr. John Doe, who does not own the rights or title to the property. He has erected the buildings during the night and has been extremely rude and hostile to the neighbors who have voiced complaints. I hope that you can spare some personnel to deal with this act of blatant lawlessness as soon as possible. Thank you for your time.